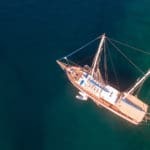 You have a whole week to do the gulet cruise scene and to top it all off so sweetly, an array of Turkish gulets to choose from, for a great adventure in the Mediterranean or the Aegean or both! You itinerary offers multiple combinations. However for the purpose of a superb experience in two different cultures, we combine breathtaking destinations from the Turkish coast, all the way over to the timeless Greek Islands. Your Marmaris blue cruise holidays will begin from the harbor where your gulet will be waiting all stocked up with food and other provisions and the crew looking forward to meeting their new guests. On your first day, it will be a getting-settled-in, meeting the crew and touring the gulet, kind of day, and possibly going over your itinerary with your captain. Depending on the time of your arrival, you might wish to have a look around the harbor and go for a stroll. The waterfront, promenade is a lovely area of Marmaris. All the shopping, marketplace, restaurants, bars, cafes, night clubs and beach are with minimum walking distance. After a brief stop in Serce port for customs formalities you will cruise to Bozukkale by Serce limani (Serce port) – your first destination on day 2 of your luxury gulet holidays. The ancient city of Bozukkale (Loryma), you will find a castle and 9 towers. Your gulet charter will cruise to Bozburun region during the early morning hours where you will enjoy a lovely Turkish breakfast on the 3rd day of your gulet cruise holiday. Then follow your gulet cruise to Bencik for lunch and a swimming break. Bencik is located at the narrowest part of the peninsula that divides the Hisaronu Gulf from the Gokova Gulf. You will overnight in Bencik and enjoy a tasty breakfast the following morning. You will reach Aktur bay on your 4th day where you will enjoy a lovely lunch and take some leisure time for some fun in the water. On this same day, you will have a tasty Turkish dinner – absorbing the fantastic views, and spend overnight in Datca. 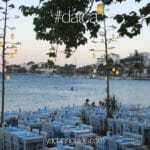 On your 5th day of your blue voyage, there will be customs formalities in Datca. 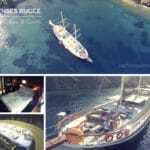 From there your gulet will set sail to Symi Island and anchor at a near bay for lunch and a swimming break. During the early hours of the morning, your gulet will voyage to the spectacular island of Rhodes in Greece. After dinner, the guests are highly recommended to enjoy a Rhodes night out. On the 7 th day of your blue cruise holidays, the gulet will be anchored at Cennet Island (Paradise Island) where lunch will be served followed by leisure time and swimming break. 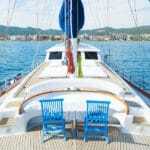 Later on in the evening you will be anchored at Marmaris harbor for dinner and overnight stay. On the morning of your last day, you will wake up to a full breakfast table. Then disembark shortly after your breakfast in the harbor when the crew bids you a friendly farewell. The most ideal type of vessel to experience a true blue cruise holiday is on board a gulet. These elegantly handcrafted boat charters in Turkey are what offers that traditional and cultural feel of being in Turkey. From Marmaris there are many to choose from. Below are a few of the most popular choices in different classes and price ranges.